6-Show Seated Season - choose your seats before everyone else, get immediate discounts on the summer production and our Season Soiree! and save up to 33% - that means one season show is free! 3- or 4-Show Flex Pass - choose a 3 or 4 pack of tickets to be used for any show(s) in any way you'd like and get the most flexibility and a savings of up to 20%! 6-Show Day Pass - the deepest discount with the ability to make last minute decisions and make your reservations in your own time, plus receive up to 40% off single tickets! 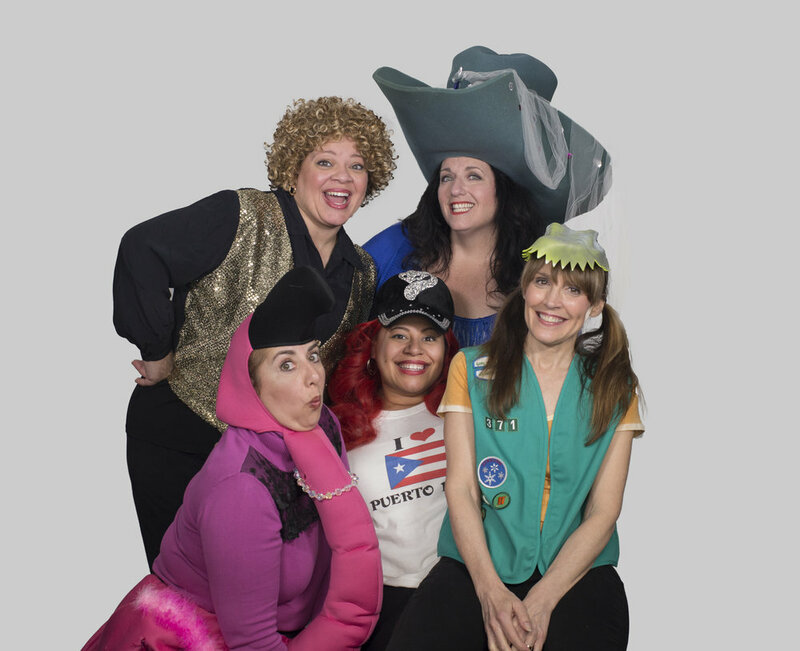 Popular sketch-comedy troupe EstroFest marks its 20th anniversary of entertaining audiences, first taking the stage in January 1999. They invite you to laugh uproariously with them, as they present an over-the-top show of hilarious sketches and outrageous videos. City Newspaper’s Frank DeBlase declared, “EstroFest was a blast … laughed our heads off!” and critic Jack Garner said, “EstroFest gets you laughing and gets you thinking.” EstroFest is Dresden Engle, Andrea Holland, Norma Holland, Allison Roberts, and Freyda Schneider, who produce original and universal material that is often compared to Saturday Night Live (… but funnier). The five ladies of EstroFest will be joined in April by fellow founder Adele Fico, who will recreate her celebrated “Nonna” character, plus Danny Hoskins of Blackfriars Theatre, who will appear in several videos and play a range of characters alongside the funny ladies. Friday, April 19 at 7 p.m.
Saturday, April 20 at 7 p.m. The BCS was created in 2015 and offers the Blackfriars audience and the Rochester Community a season of hysterical long form improv, original themed comedy specials and dark, irreverent sketch comedy! NOVEMBER 30th & DECEMBER 1st at 8 p.m.
FEBRUARY 22nd & 23rd at 8 p.m.
APRIL 26th & 27th at 8 p.m.
Join us for the first ever Flower City Drag Battle this June! An evening of drag, drinks, and dancing to benefit Blackfriars Theatre’s 70th Anniversary Season, with your hostesses, Mrs. Kasha Davis and Aggy Dune! This Drag-Spectacular will feature an array of contestants, who will showcase their dynamic looks and one talent performance, battling it out to be crowned Flower City Queen or King. Finalists will then compete in a lip-sync battle for a winner-take-all grand prize of $1,000. *VIP tickets include on-stage seating, signed company poster and a photo with the cast. Saturday, June 8th at 8 p.m. APPLY TO WIN THE FLOWER CITY CROWN! Looking to become a cast member? Hit the button below and apply for your shot at $1000! Drag Story Hour is a program of Blackfriars Theatre and takes place at the theatre. Blackfriars Theatre offers a new 12-event series for Rochester families who like a little extra sparkle with their story time – Drag Story Hour with Mrs. Kasha Davis. This free program features inclusive children’s stories read by RuPaul’s Drag Race’s Mrs. Kasha Davis. Books will focus on themes of acceptance, love, identity and diversity. Each event will include a story, a dance party and a craft activity. Drag Story Hour teaches love and acceptance, gives strength to kids who see themselves differently, and serves as a resource for parents who need support or want to learn more. The Out Alliance has partnered with Blackfriars on this project and will have representatives at each story hour to help answer tough questions and to act as a community resource for families who might benefit from their programming and expertise. Drag Story Hour is presented in partnership with The Out Alliance with additional support from Get Caked and Quentin Roach. 2019-2020 Drag Story Hour with Mrs. Kasha Davis dates will be announced in spring of 2019! ALL DRAG STORY HOUR EVENTS ARE FREE AND TAKE PLACE AT BLACKFRIARS THEATRE. “Children need adults to provide them with the opportunity to express their true and authentic selves and I believe we need children to remind us that no matter how complicated adults make this world, we are all seeking one common goal: TO BE LOVED.” - Mrs. Kasha Davis. We are thrilled to announce that Hourglass Play Reading Series has become an official program of Blackfriars Theatre for the 2018-2019 Season. Founded in 2010 by Sandi Henschel, Barbara Lobb and Maria Scipione, HPRS continues to present readings of thoughtful, well-crafted plays that explore culturally relevant themes, and give voice to diverse stories. Leading the team for the 2018-2019 Season are Co-Artistic Directors Jodi Beckwith and Eric Evans, as well as Associate Producers Lynne Sanchez-Fries, Jack Simel and Esther Winter. The Hourglass Play Reading Series productions are free with donations accepted at the door. Reservations are strongly encouraged - reservation form on the 2018-2019 Season page (button below). For more information about the Hourglass Play Reading Series, email Hourglass@blackfriars.org. All readings are cast through an audition process. Please click here for more information on auditions. Join Blackfriars Theatre for a fundraising event to benefit our Summer Intensive educational programming and be a part of the Fifth Annual Season Soirée. Experience a unique night of musical theatre, comedy, parlor games, raffles, delightful desserts and drinks. Plus, YOU pick next Season's big musical! During the evening, along with being treated to light comedy and artistic surprises, you'll enjoy a selection of performances from musical theatre titles under consideration for the coming season and be given the opportunity to vote on the show you'd most like to see next year. At the end of the evening, the entries will be tallied and we'll unveil the big musical of your 2020-2021 Blackfriars Season! EVENT: Saturday, November 23rd, 2019 | Reception at 7pm | Musical Program at 8pm. VENUE: To be announced at Season Announcement Event - February 18th at 7 p.m.
FUNDRAISING DETAILS: Attendees have the opportunity to purchase Voting Chips. Throughout the night, you will be given the chance to cast votes for your favorite show. Each chip is the equivalent of one vote. Purchase as many Voting Chips as you like – all proceeds will go directly to support Blackfriars Theatre Summer Intensive (BTSI) educational programming. At the end of the night, all the chips cast will be counted and the show with the most Voting Chips will be programmed in our 2020-2021 Season! Vote often to ensure your favorite musical will grace the boards of our 71st Season – and support Blackfriars Educational Programming with every chip purchased! Voting Chips are available during the event only. Titles of shows under consideration will be unveiled at the event. In addition to these voting chips, Soirée attendees can support the theatre by buying raffle tickets and participating in our Soirée wine pull. Can't make the event but still want to support the blackfriars theatre summer intensive? You can make a tax deductible gift by clicking the button below! where Next to Normal was chosen as the musical for the 2019-2020 season! Ten days of enthusiasm, creativity, energy, generosity and inspiring dedication to our Rochester community. Blackfriars Theatre is always honored and thrilled to be a part of The KeyBank Rochester Fringe Festival! Visit their website for more information at rochesterfringe.com. The 2019 KeyBank Rochester Fringe Festival will return in September 2019.